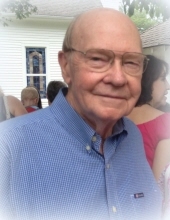 A. Derrell Hightower, age 85 of Marietta, formerly of Carrollton, passed away September 25, 2018. He was born February 11, 1933 in Carroll County, son of the late Alton Hightower and Myrtice Hammond Hightower. He retired as V.P. of Operations for Atlantic Envelope after 46 years of service and was a member of Shiloh United Methodist Church. In addition to his parents, he is preceded in death by a daughter, Faye Burel; brother, Larry James Hightower; sister, Carolyn Hightower and nephew Brandon Hyatt. He is survived by his loving wife, Lillian Jeter Hightower of Marietta (formerly of Carrollton); daughters and sons-in-laws, Gayle and Scott Kelley of Duluth, Lynn and Earl White of Marietta, and Sam Burel; sister and brother-in-law, Diane and Billy Hyatt of Carrollton; brother and sister-in-law, Weems and Sharlene Hightower of Carrollton; sister-in-law, Shirley Hightower of Carrollton; and many nieces and nephews. Funeral service will be conducted Sunday, September 30, 2018 at 2:00 PM from Shiloh United Methodist Church with Mr. Scott Eason and Rev. Bill Cody officiating. Interment will follow in the church cemetery with the following gentlemen serving as pallbearers: Scott Kelley, Earl White, Tony Hightower, Sam Burel, David Hightower, Roddey Stevenson, Ben Wingate, and Jacob Conn. Honorary pallbearers will be Jim Stribling, Woody Jeter, and Dennis Crews. The family will receive friends at Martin & Hightower Heritage Chapel on Saturday, September 29, 2018 from 5:00 PM until 7:00 PM. In lieu of flowers, donations can be made to Shiloh United Methodist Church, mark for “Campground Fund” at 1874 Burwell Road, Carrollton, GA 30117 or to Tranquility Hospice at Kennesaw, 475 Dickson Avenue, NW Marietta, GA 30064. To send flowers or a remembrance gift to the family of A. Derrell Hightower, please visit our Tribute Store. "Email Address" would like to share the life celebration of A. Derrell Hightower. Click on the "link" to go to share a favorite memory or leave a condolence message for the family.